China presents itself to the world as a nation that is committed to religious freedom, and in recent years laws have been passed purporting to underline this commitment. And yet, in spite of this apparent commitment, Release partners China Aid report that documented cases of persecution are increasing. As recently as 2014 it reports that almost 18,000 individuals suffered persecution – 1,592 of whom were church leaders. They include prominent Christian lawyers and pastors who have stood up for the rights of the poor. Those who question the authorities can find themselves branded enemies of the state and charged with undermining national security. Even so, the church is growing, and is contributing to church growth elsewhere. In 2015, more than 900 house church pastors pledged to send 20,000 missionaries to other nations by 2030. One Christian lawyer who has suffered greatly is Li Hepeng. Li was initially taken from his home in 2015, during a nationwide roundup of human rights lawyers. During the first six months of his imprisonment, he was tortured, and after nearly two years of arbitrary imprisonment was found guilty of “subversion of state power”. He was sentenced to three years in prison with a four-year suspension, depriving him of political rights for four years. Release partner China Aid works to expose abuses such as those suffered by Li Heping and his family in order to stand in solidarity with persecuted Christians and promote religious freedom, human rights, and rule of law. Through China Aid Release supports Christians in China through printing, producing and distributing a book about Christian marriage, Bibles and other Christian resources. We also support workers in China who investigate cases of persecution, provide support to families and arrange legal aid. Our Christian family in parts of central China say it is now ‘dangerous’ to be a believer – amid arrests, cross removals and intense persecution in Henan. The focus of the authorities’ crackdown is apparently churches in Luoning County: many have been detained and Christians say they are now too scared to meet together. Preaching and gathering for worship are said to have been banned. Please pray that God will give wisdom to His people in Luoning to know how to respond to this wave of persecution. The prompt for the campaign of violence appears to have been new Regulations for Religious Affairs which came into force last month and which relate to registering church activities. House churches in Luoning have had windows smashed and property confiscated. One video (below) shows a local official demolishing a tile mural depicting Jesus on a private home. Preachers have been prevented from giving sermons in several districts of Luoning. In Shangqiu district, four crosses on the historic Nantang Church were removed last Friday: officials also cut off power to the church and arrested its pastors. ‘It feels like another Cultural Revolution,’ said one believer from Shangqiu. Pray that the Sovereign Lord will come in power to this area of central China ‘with a mighty arm’ (Isaiah 40:10). Ask Him to sustain and encourage His people there. Pray that our Christian family in Luoning will find new, creative ways to fellowship and encourage one another in their faith. Pray for a radical change of heart among Henan officials: may they see the folly of repressing religious liberty and trying to silence the word Of God. Read more about our #Pray50 campaign. Praise God for Bob Fu’s visit to the UK: Bob is the founder and President of our partner China Aid, a former house church leader and former prisoner of faith. Join us at a lunch meeting in London tomorrow (Saturday, March 15th) to hear Bob talk about ‘Christian persecution in China’: 12.30-3.30pm at St Michael’s Church Chester Square. Book your place today, or find out about his other speaking engagements here. 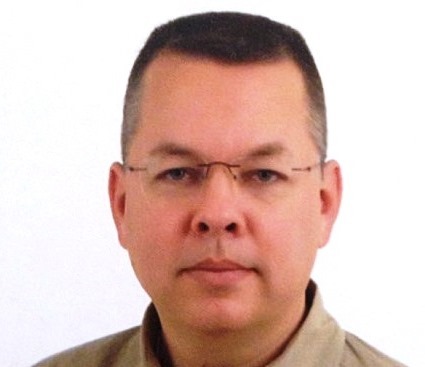 Please pray for our brother Pastor Andrew Brunson (pictured) who remains in prison in Turkey on false charges. On Tuesday, the prosecutor charged him with being a lead actor in the Fetullah Gulen terrorist group. The official indictment demands that he be imprisoned for life and, if it is accepted, his case will go to trial. Ask God to strengthen Andrew and his wife, Norine: pray his case will be thrown out. Please also pray for our Iranian brothers Eskandar Rezaei and Suroush Saraei who were each sentenced on December 28, 2017, to eight years in prison. They are now appealing their sentences: pray their appeals will be heard swiftly and be successful.